Asturian Valley (also known as Asturiana Occidental,rnAsturiana de los Valles, and Carrenana) cattle are raised for both milk andrnmeat production. They originated in the valleys of Asturias, Spain and belongsrnto an exclusive bovine group in Spain known as the tronco Cantabrico (Cantabricrntrunk). rnrnThey are mostly raised in the northern coastal areas on thernBay of Biscay and the river valleys at the foot of the Cordillera Cantabricarnmountain range. rnrnTheir importance as dairy cattle has reduced since otherrnhighly productive dairy cattle breeds have been introduced to Spain. They werernthe most abundant breed in the northern part of the country during the 19thrncentury. But a massive addition of highly productive foreign breeds dangerouslyrnlowered their total numbers at the beginning of the 20th century to aboutrn22,000 animals only. Now they are spread to some other parts of Spain. rnrnThey are medium-sized. They vary from dark brown to lightrngolden brown. And sometimes with a white head, apart from their eyes. Sometimesrntheir underside of the abdomen can also be white. Both bulls and cows usuallyrnhave horns. Their horns are of medium sized and usually straight. 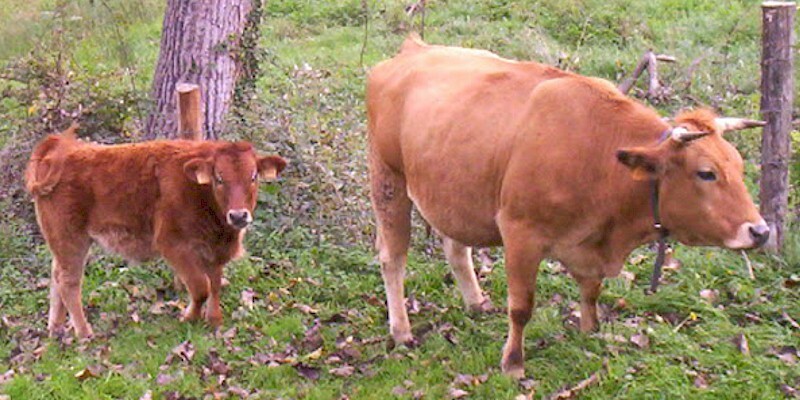 rnrnAverage live body weight of the mature Asturian Valley cowsrnis around 600 kg. And the mature bulls on average weight around 700 kg.